Now with Full Color Printing on the Branded/One Side of the Dice! Our 3/4" Custom Loaded Dice are weighted to feature your company logo – on the top/one side of the dice – on most rolls (the dice favor the logo side approximately 70% to 80% of the time they're rolled). The other five sides of the dice (sides 2-6) feature standard, indented dice spots. Our Customized Loaded Dice are great for tradeshows, mailings and other promotions, and much more! 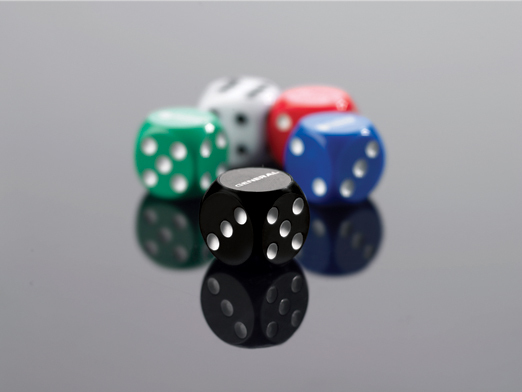 You can choose from 5 Loaded Dice colors – Black, Blue, Green, Red, and White. The minimum order is just 200 Branded Loaded Dice. Your satisfaction is guaranteed when you order Custom Dice from Gameparts. Custom Loaded Dice Pricing – Includes Your 1 to Full Color Design on the "One" Side!